The Wedding Party Bridal Show sponsored this show to make sure you do not miss their unbelievable event happening this Sunday! It is sure to be an excellent event. TIMES: Doors open at 12 noon event goes until 5 pm - come anytime! Fashion Shows at 1, 2, 3 and 4 plus the many events ongoing throughout show. 207 5th Avenue, San Diego, CA 92101, located in the heart of the Gaslamp downtown San Diego, park in the lot on 6th right next to the hotel for best rates. 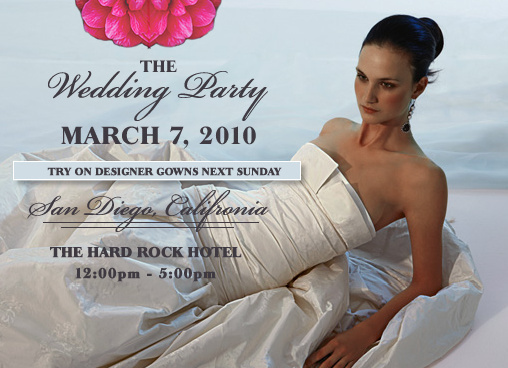 The Wedding Party Bridal Show In San Diego has a special "Say YES to Your Dress" sample gown changing area for you to try on the top designers right at the show!Don't worry we'll send the boys to the Groom's Lounge so they don't see you!